Ozark Adventist Academy knows that the cost of a Christian education can seem overwhelming. Regardless of your financial situation we will make every effort to make an education from Ozark possible. There must be a balanced financial plan for the current school year and the account must be kept current. Parents are responsible for any variation in the budget listed in the financial agreement. The account must be paid before a diploma, transcript or transfer grades will be issued. The account for the applicant or applicant’s siblings for previous years at Ozark Adventist Academy must be paid before the student may enter school for the current school year. 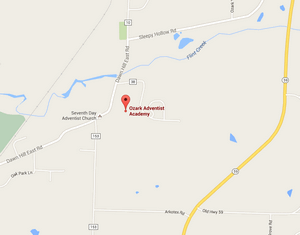 Ozark Adventist Academy has a work program in a variety of areas. Students may earn around $2,500 during the school year. The amount can vary due to class schedule, student’s motivation, and extra-curricular activities. Again, if you have the desire for your student to attend Ozark, please give us a chance to design a monthly payment plan to fit your budget. If you have any questions or would like to arrange to visit the academy, please call 479-736-2221. There will be a 10% discount on Down Payments (actual amount paid) received by July 15. No discount for early payment will be given if there is a balance due from the previous year. Payments made by credit card or debit card will not receive this discount. Financial aid requests are processed as part of the admissions procedure. Frequently a student’s home church will participate by financially sponsoring him or her. Ozark will match the church’s contributions up to $750 for dorm students and $500 for village students for the school year. For those students residing in Arkansas and Louisiana the Conference will also match the church’s contributions up to $750 for dorm students and $500 for village students. These contributions should be made to Ozark Academy by October 1st. Students can increase their hourly wage by recruiting their own work sponsors. Sponsors contribute either a flat monthly amount or an hourly amount. Our flat rate covers tuition, full room and meals for boarding students, entrance fee, one instrument rental, lab fees, recreation fee, student accident insurance, workers’ compensation insurance, class dues, textbook rental, and noon meal on school days for day students. Each student must pay a $400 non-refundable entrance fee at or before registration. It is also recommended that each student make a down payment equal to one month of tuition ($1,020). If the student is a dorm student one month’s room and board should be added as well ($600). An individualized payment plan will be created for the remaining amount. Families may choose a 9, 10, 11 or 12 month payment plan. All payment plans need to be completed by August 10 of the following year. There are two methods of payment for your child’s education at OAA. We will assist you to determine which method of payment would be best for you. The first method of payment is payment in full. A 5% discount will be awarded for paying a school year in advance (3% for a semester). Payments made by credit card or debit card will not receive this discount. The second method of payment is to enroll with OAA Diamond Mind for monthly Automated Payments (ACH). Private Music Lessons As arranged with teacher. Doctor's Fees & Prescriptions Charged direct to parent by provider. Day Student to Stay in Dorm $10/night. Touring organizations may have other fees depending on uniforms, clinics and other special tours. Any transportation charges or other extra charges are payable directly to the school. These are not included in your regular payment plan amount. OAA is happy to welcome international students who are interested in a Christian education and who understand the unique mission of our school; however, we have a limited number of places open to international students. Refunds are only permitted for serious illness when it is the attending physician’s opinion that the student should return home. Refunds are not available for other reasons, including disciplinary withdrawals. Ozark Adventist Academy requires that all international students pay the total school fees before an acceptance letter for a student visa may be issued. International students are not eligible for discounts or student aid. English language assessment testing may be required of students in order to determine proper placement in classes. Early payment discounts do not apply. International Students must provide English translations for all school records, transcripts, immunization and medical records. For more detailed information see the Student Handbook.